If you follow me on twitter, you may know that I am fighting a very-familiar battle for cheesers out there. The battle is against big dairy corporations, their lobbyists and elected officials with no backbone. The fight is over pasteurization and this time the battleground is Mexico. However, the fight does not look much different in the rest of North America, Australia or New Zealand for that matter. My battle is against a law proposed in the Federal Congress by the Ministry of Health that would outlaw cheesemaking using raw milk. The passage of the law would not only criminalize small artisanal producers, it will also constitute an assault to our culinary culture. Yes, I know that both charges are really strong, but that is exactly what this proposed law (we'll call it NOM 243 by it's filling number) would do. Let me explain why and present the case for raw milk cheeses in an entirely Mexican context. If this sounds familiar to you, but you are not from Mexico or live there, it may be because a very similar situation exists in your country. Let's start with a basic facts, Mexico did not have cheesemaking or any dairy industry before the colony. It was with the arrival of the Spanish and Italian monks that cheese made it's way to Mexico. This, however, does not mean that cheese is still foreign to Mexican cuisine. What it means is that cheese, like many other food ingredients in Mexican cooking, is a clear representation of a complex, varied, and vibrant culinary culture. This culture inherits a strong indigenous sense with ingredients like corn, chilies, chocolate, cactuses, tomatoes, and vanilla. It borrows techniques from Spain like salting fish and meat and integrates milk (and it's by-products), bread and most meat into the cuisine. But the story does not end there. Mexican cuisines also learnt and incorporated French sauces, Italian meat curing, Chinese soups and broths, and we also use tahini and pickles from Mexicans whose backgrounds are Lebanese and Jewish. Increasingly our food is also influenced by new immigrants from Haiti, Argentina, Central America, Brazil, Korea and also from the US. It is exactly within this diversity that Mexican cheese finds its place in our cuisines. Cheese in Mexico is not only a food product, for many is a way of life. Here I am talking of the small artisan producers who produce unique cheeses in all regions of the country. 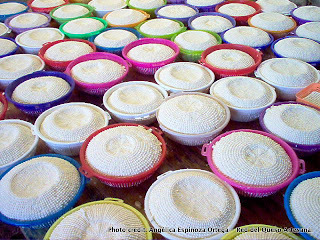 Think for a second of the Menonites of Chihuahua, the small communities (some indigenous peoples included) of Oaxaca and Chiapas who make Quesillo or Queso de Bola or Queso de Cuadro and of small ranchers in Michoacan who turn amazing raw milk into Cotija cheese. Those artisan cheesemakers learnt their craft from their grandparents who in turn learnt from their grandparents. Most of them use raw milk to make their cheeses. They have small herds that are taken care by the immediate family and worry a lot about the well-being of their cattle, their cheese and their customers. If the proposed law passes, it would criminalize their way of living. Most of them would have to leave cheesemaking as they won't be able to afford pasteurizing machines and will rather sell milk for liquid consumption. Others would defy the law and continue making cheese with raw milk, but their productions will be pushed to the illegal market raising the real risk of having an outbreak of food-related illnesses from dairies that are not carefully inspected and regulated. That situation already exist in Mexico, as there are laws in place for limiting the use of raw milk, but this law will completely outlaw this practice. Just to be sure, I am not advocating for no regulation. I am arguing that we don't need laws that prohibit completely traditional ways of cheesemaking and that instead we need strong mechanism for monitoring that the raw milk that is used for human consumption is clear and free of pathogens that can affect human health. In a sense this proposed law is the option to solve a problem on the cheap. By outlawing all production of cheese with raw milk, the government only needs to enforce the law by sanctioning producers who go against the law. While establishing a monitoring system, guidelines, and trainings for dairy producers and cheesemakers, is expensive, labor intense and requires long term planning. Outlawing something from a comfy office in Mexico City is the easy way out. The project that I am involved with in Chiapas to create a collective trademark for the Queso de Cuadro is the right solution. This project involves producers, farmers, government and academia in finding a way to maintain traditions while ensuring that cheesemaking is safe and clean. It is an initiative that has the backing of many stakeholders, making it a slow process, but at the same time it ensures that the ultimate decision would have the backing of all involved. So what is it about raw milk? Why are so many of us fanatics of it and what does it have to do with Mexican culinary culture? Before I answer to these questions, let me tell you a short story about one of the cheese judging competitions that I hosted in Chiapas. In my first trip to Chiapas, I tasted 45 samples of Queso de Cuadro. There were producers from the many regions of the state, and while most cheeses tasted similarly I was able to taste the terroir of the farms where these cheeses were produced. Those from the mountain region were dryer and fattier. The ones from the plains were more lactic (milky) with fresh smell of grass and those from the coast were sweet and aromatic (like tasting flowers). One cheese from the coastal region stood up in smell and flavor. It was sweeter than the others and the smell reminded of ripe fruit instead of flowers. After the competition, I asked the producer of this unique cheese about his herd, the location of his farm, the weather in the region and finally about the feed the cows eat. I was surprise to find out that while his dairy is similar to all other in the region the feed that he gave the cows included a stick of sugar cane in the middle of the day. He said that the cows loved the sugar and produced better milk. He said that he was worried that I was gonna ask him to stop feeding sugar canes to the cows. Instead I was for the first time realizing how much impact feed has on the final flavor of the cheese. Pasteurization kills harmful bacteria and pathogens in milk, but it also destroys all the complexities in the milk from the various aspects present in the terroir. This means that flavors are more generic and it really doesn’t matter where cheese is made, as no trace of the location where is made is maintained. However, taste alone is not enough to argue that milk should not be pasteurized, especially if there are concerns about the quality of the milk. Here is exactly, where the minutia of the argument becomes relevant. The solution is to ensure better milk, cleaner and safer techniques, and also to care and be responsible for milk producers’ livelihoods. This is impossible to achieve when the only reasoning behind producing milk is to turn a profit. Milk, while treated as a commodity in economic markets, it is also a food for human consumption. However a lot of people, companies and farmers forget this. They only see dollar/peso sings in the liters/gallons of milk produced and not a food with nutritional value, a story and benefit for our population. Food companies are not in the business of feeding people, they are in the business of making profits with products that we all need daily. We need to move away form this economic model, which is ending traditional ways of production and hurting our environment. The solution is smaller farms, local consumption and care for the trade of farming. This is why I advocate for raw milk, to support our dairy farmers who are willing to produce good milk for us because they love what they do, not because they want to turn a profit at expense of the animals and the consumers. If you are interested in learning more about the campaign in Mexico against NOM 243 follow me on twitter (@carlosyescas) and make sure to be ready to talk about raw milk to everyone that needs help understanding why this matters. For resources in English visit the Alliance for Raw Milk Internationale, they have info about similar movements all around the world. I also posted this on my Facebook account and here is a response that I got there from Kevin Sheridan. Thank you for this really informative update on your great campaign. As you know I too am passionate about the many benefits of raw milk cheeses. It sounds to me that you have a real battle on your hands. Whether we can prove it or not raw milk cheese is internationally perceived as being of higher taste quality. Artisan raw milk cheese offers an opportunity for farmers to turn a commodity product into a high value added product; in turn bringing more money and employment into the local economy. A rich food culture; of which artisan and raw milk cheese production is of fundamental importance; is a real asset to a country. Artisan foods can act as ambassadors for the general food industry. Food tourism is becoming a more and more significant portion of the overall market, it is also a higher spend area. Authenticity and 'real' cultural experience is an essential element. Once a food culture is lost it is very difficult to ever recover. I am not sure if any of this can apply to your national situation, but I do think that you need to speak their language and most of that language revolves around economic benefits. It has worked well here and the situation for the raw milk cheese makers has improved a lot. I admire your campaign hugely - as Kevin says, here in Britain and Ireland we have a strong artisan cheese culture using raw milk. In fact the whole debate over unpasteurised milk for all uses seems to be on the rise. I know of two small dairy farmers (one I wrote a piece about here: http://acookslibrary.com/2010/06/06/the-raw-milk-round-2/) who see the only way they will make a profit (wholesale milk prices often being lower than the cost of production) as being to start supplying raw milk, from cows fed on varied pastures, to individuals and producers. I know from fellow fans of raw cheese that the situation in North America is far worse than here so GOOD LUCK to you and everyone else fighting for this delicious food!